Russia’s position in WWI was difficult. Military support for Serbia meant all-out war, failure, and social revolution. Inaction meant criticism from Pan-Slavist parties. Russia’s entry into WWI helped speed the demise of the tsarist regime and paved the way for the Revolution of 1917. While Nicholas II may not have had much choice in his decision to enter Russia into WWI, Russia’s position became increasingly unstable as the war wore on. When Archduke Ferdinand was shot in Serbia in 1914, Russia announced its determination to protect this fellow Slavic nation from Austria, who declared war on this Balkan nation. The idea of Pan-Slavism had been growing in popularity during this time period, and this rally of Slavic pride eventually helped to convince other Slavic nations to support opposition to the Central Powers. However, Russia also wanted to protect its position in Southeastern Europe, and Serbia was one of its only remaining allies in the volatile region. Unrest among the peasant population and a weak military meant that Nicholas II had to worry about both the possibilities of revolution and military defeat, as well as the declaration of war by Germany, who was allied to Austria. Unfortunately, not entering the war meant abandoning Serbia to Austria, which caused the most ardent Pan-Slavists to protest. For awhile, Russia saw an increase in patriotism. Officials admitted that Russia’s military would not be ready for war until 1917, but Nicholas II disregarded this significant point and entered the war prematurely. 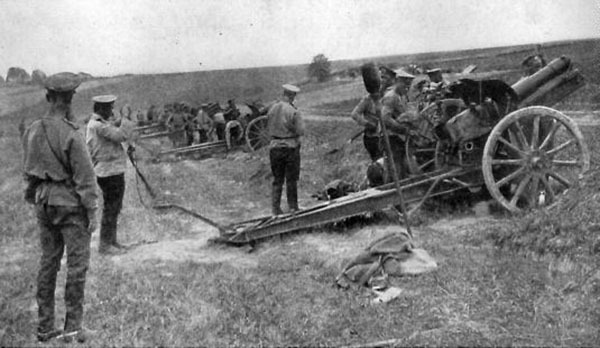 Mobilization of the Russian forces was slow; Austrian forces were much more agile. Early mobilization was the only chance for success. Thousands of peasant conscripts, under-equipped and lacking training, who knew almost nothing about politics or geography, were sent to fight enemies thousands of miles away from homes and families. With an ineffective Nicholas II at the helm, the military had no strong commander, and in many respects it was woefully mismanaged. As Nicholas II’s interest in the war deteriorated – particularly after the assassination of Rasputin – so did the situation in Russia. Russia’s position in WWI sparked social revolution and helped bring an end to Nicholas II’s rule. Russia’s military morale was sunk, there was widespread suspicion of treason at the highest level (Nicholas II’s wife was German and was accused of maintaining sympathies towards Germany), and the general population began to stage ever-stronger strikes against supplies shortages.